Tree Top Quest – TowersStreet - Your premier Alton Towers guide! Please Note: Tree Top Quest last operated at the end of 2017. It is due to be closed for the foreseeable future. Are you brave enough to take on this Aerial obstacle course and swing through the tree canopy, all whilst taking in the amazing views of the Staffordshire countryside? 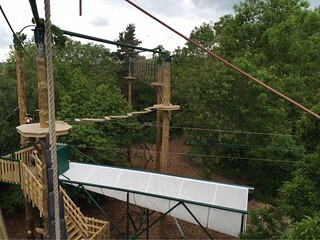 If so then buckle-up and prepare for Alton Towers Resort’s Tree Top Quest. 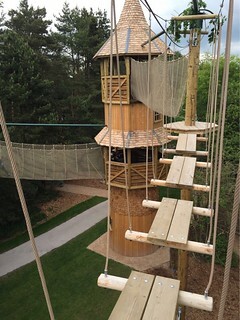 Tree Top Quest is located next to the main drive that takes you to the resort’s three accommodation options: Alton Towers Hotel, Splash Landings Hotel and finally the Enchanted Village, which Tree Top Quest forms part of. If you choose to take on the attraction you have the option of two courses; a low ropes course that is around 3m (10ft) off the ground or a high ropes that is as high as 8m (26ft)! There’s a limited number of groups allowed on the course at anyone time, so it’s advisable to book ahead to guarantee a slot. More often than not though, there is usually space for guests who make a last minute decision to do it. When you arrive you can choose to hire a helmet cam and record your adventure, though this isn’t compulsory. You will then be taken by a member of staff to have your safety harness fitted. The harness is then fully checked before you head over to the practice area. The practice area has one obstacle and a mini-zip wire, both only a few feet from the ground. Here you learn how to traverse the course on the safety line and you’re given a run through of the various safety rules. After that you head over to the tower and climb to your chosen course. Both courses offer a variety of challenges, from swinging platforms, climbing walls and rope bridges. Though the obstacles can be challenging you are always attached to a safety line so even if you do fall you wont drop more than a foot or so (which adds to the fun). There’s also a number of small zip wires dotted around the course, and at the very end you reach the large zipwire allowing you to fly through the trees at a dizzying speed (don’t forget to smile for the camera!). If you don’t want to take to the skies you can follow your friends progress as most of the course is visible from pathways on the ground. Alternatively, you can also grab a drink and a snack from the “Crooked Teaspoon” outlet. Once you’ve completed your challenge, you’re de-rigged from your safety equipment and you can view your zip-wire photo back on solid ground. 1m tall and over 6 years. 6 - 7 year olds will require one to one supervision on the course by a full paying adult who is 18 years or over. 1.4m tall and over 11 years. 11 -12 year olds require one to one supervision on the course by a full paying adult who is 18 years or over.